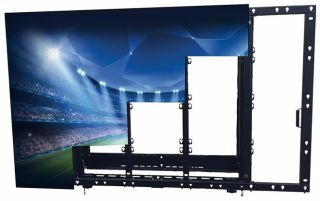 Peerless-AV, the leader in innovative mounting and audio and video solutions and accessories, today announced the industry’s first Universal Modular LED Wall Mounting System. Featuring a quick and easy pop-out mechanism that can be adapted to support various brands and display sizes, Peerless-AV’s LED Wall Mounting System offers a modular design enabling custom installs for specific configurations. The universal nature of the LED Wall Mounting System will give installers infinite choices as they look to specify more full-color, high brightness, big viewing angle LED displays in their projects. Key features of the Universal Modular LED Wall Mounting System include a clean and aesthetically pleasing installation based on a slim, space-saving design. The pop-out mechanism extends the mount 30 inches from the wall, providing ample space for a technician to service and maintain the LED displays. Its universal design can be easily configured to support most LED brands and sizes by simply changing out display-specific adapter plates. The mounting system’s easy hang wall plate enables a fast, trouble-free installation and handles on either side of the mount provide easy mount articulation without the risk of damage to the LED display. In addition, integrated cable management allows for a clean finish. Adjustment to the LED Mounting System is simple and installer-friendly. A jacking screw feature allows the entire video wall to be plumb adjusted once all the LED displays are installed. Each mount has four-corner depth adjustment and a first row levelling function assures all the LED displays align for a seamless appearance. Peerless-AV’s Universal Modular LED Mounting System will be available for custom order through its network of distributors and resellers in Q2 2016. This new innovation can be seen at ISE 2016 – Hall 11, Stand E70. Visitors to the stand will be given a VIP tour, including presentation of an impressive 5x4 video wall using Absen LED panels mounted on the modular system.